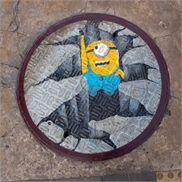 A 'minion' is drawn on a manhole cover on Xidan shopping street in Beijing. In addition to this one, other cartoon images such as SpongeBob have been drawn on manhole covers to make them more colorful. An unmanned bus travels along a completely transparent glass bridge in Zhangjiajie, Central China's Hunan Province on Wednesday. The 430-meter-long bridge is 300 meters up from the valley floor. A 6-meter-tall sculpture of a chili is featured on a public square in Southwest China's Chongqing Municipality, where residents are crazy about spicy food. An animal handler cares for a young kangaroo in a makeshift pouch, while another joey eats from its bowl at the Chimelong Safari Park in Guangzhou, South China's Guangdong Province on Monday. A young woman sits in a car made of cardboard built by a group of young people on Saturday in Changzhou, East China's Jiangsu Province. The cardboard cars were replicas of real cars. Hundreds of people wait for a bite of a giant three-square-meter cake in Luoyang, Central China's Henan Province on Saturday. The cake was made to celebrate the coming of the Grain Rain period, one of the 24 Solar terms. A father-to-be experiences the pain of childbirth thanks to a device in a hospital in Taiyuan, capital of North China's Shanxi Province on Saturday, as his wife holds his hand in support. Two men wearing traditional Chinese gowns and dressed as bronze men stand in front of a store on Nanjing Road in Shanghai on Thursday to attract customers. High school students walk a red carpet during a coming-of-age ceremony in Nanning, South China's Guangxi Zhuang Autonomous Region on Saturday. Passing through an arch symbolizes the students have become young adults. Wu Shiying, a farmer living in Shiyan, Central China's Hubei Province, cradles his telescope on Tuesday. Wu is an amateur astronomer and has been building an observatory in his village, which will open to the public in August. Child models strut along the catwalk during a fashion show featuring the works of Li Xiang, a Chinese designer of children's clothing in Shanghai on Saturday. A giant dragon boat with 60 paddlers participates in a race on the Lancang River in Jinghong, Southwest China's Yunnan Province on Saturday. More than 10 dragon boats competed in the regatta that celebrated the province's annual Water-Sprinkling Festival. A woman's hair stands on end as she takes part in an experiment while visiting a sci-tech exhibition in Handan, North China's Hebei province. Primary school students paint pictures in a field of flowers during a spring outing in North China's Hebei Province on Tuesday. Three primary school students wearing costumes that appear as if they are on a piggyback ride, perform a Han Opera, one of the oldest operas based in Central China's Hubei Province with a history of nearly 400 years. The performance was connected to the Wuhan Marathon that was run on Sunday. Two identical vending machines in front of a store dispense lottery tickets 24/7 in Shenyang, Northeast China's Liaoning Province on Saturday. The annual Water Splashing Festival is underway in Ruili, Southwest China's Yunnan Province on Saturday afternoon. The goal is to soak friends, neighbors and visitors with any water-carrying device available. Customers at a shopping mall in Zhengzhou, Central China's Henan Province, can write sweet messages and confess their love to their idols, including BTS, a South Korean K-Pop band that has legions of fans in China.